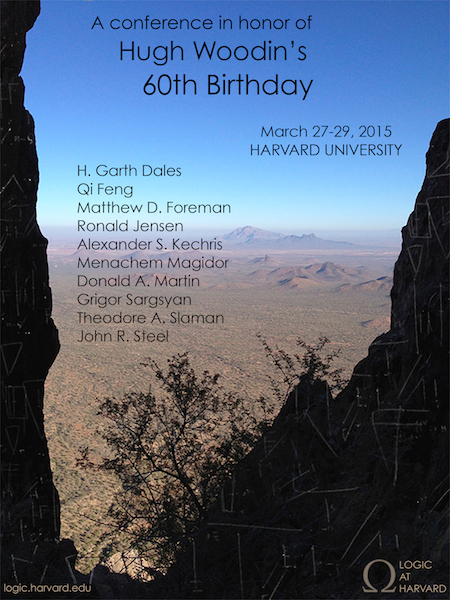 The conference in honor of Hugh Woodin’s 60th birthday will take place at Harvard University, on March 27-29, 2015. The meeting is partially supported by the Mid-Atlantic Mathematical Logic Seminar and the National Science Foundation. Funding is available to support participant travel. Please write to woodinbirthdayconference@gmail.com to apply for support, and to notify the organizers if you are planning to attend. We expect to publish proceedings of the conference, together with select additional research and survey papers, through the series Contemporary Mathematics, of the AMS. The editors of the proceedings are myself, James Cummings, Peter Koellner, and Paul Larson. Please contact me for information regarding the proceedings. Additional information can be found at the conference website. This entry was posted on Wednesday, March 11th, 2015 at 9:49 am and is filed under Conferences. You can follow any responses to this entry through the RSS 2.0 feed. You can leave a response, or trackback from your own site.